I was blessed to be able to spend a week with six of my grandkids, ages 4-13. Getting setup at Sylamore Creek Camp in Mountain View, AR. We had ladder golf to play when we weren't in the water. But most of the time we spent down at Sylamore Creek. Amy brought the kids dog, Carly, a year old boxer. The two four-year olds were best buddies. We went to Blanchard Springs Caverns. The kids had never seen anything like this before. They really enjoyed all the different types of formations. 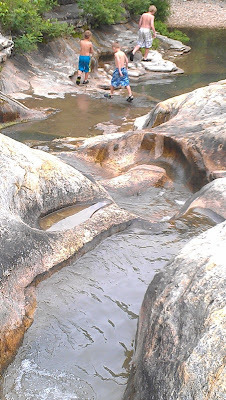 The Dripstone Trail, which is only about 1/2 mile and 1 hour long, was just enough for the kids. After, we went to explore Blanchard Springs. 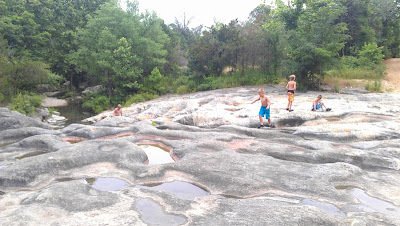 When the boys spotted the outlet for the spring, they all started scrambling over the rocks. My favorite shot of the week. Gavin actually walked up and grabbed this butterfly. I got a quick shot before he let it go and it flew off. There were lots of tadpoles and frogs and crawdads. When Aaron and Holly were there, we walked upstream to the rapids. I took my camera with me this day and it got waterlogged. Didn't actually get it in the water, but the screen started fogging over, and eventually went black. So I didn't get anymore pictures for the next few days. I went home and put the camera in a bag of rice and left it and when I removed it several days later the fogging over the screen was gone and it seems to be working again. I think I still want a waterproof camera though. One more thing to put on my list. After a week, I moved the kids to Natural Falls State Park in Oklahoma. By then my camera was working again and I got this great shot of the kids and their dad. There's not a lot at Natural Falls State Park except for the falls themselves. But in the heat, it is at least 10-15 degrees cooler here. But we were close enough to take a float trip down the Illinois River, just outside of Tahlequah, OK. I have been floating this river since I was a kid. During the summer there are thousands of people on the river. You could almost cross the river without getting your feet wet by stepping on the canoes and rafts. We had several small inner tubes and rafts (like the kind you buy at Walmart), tied them together to make a large raft, then had the kids wear their life jackets and we just floated down the river. When ever the kids got tired they could crawl up on one of the rafts or tubes. The water was fast enough to make it lots of fun, and except for only a few places, the water was only about knee deep. I didn't bring my camera because it still wasn't working good yet, so the only pictures I got were after we got off the river using my cell phone. 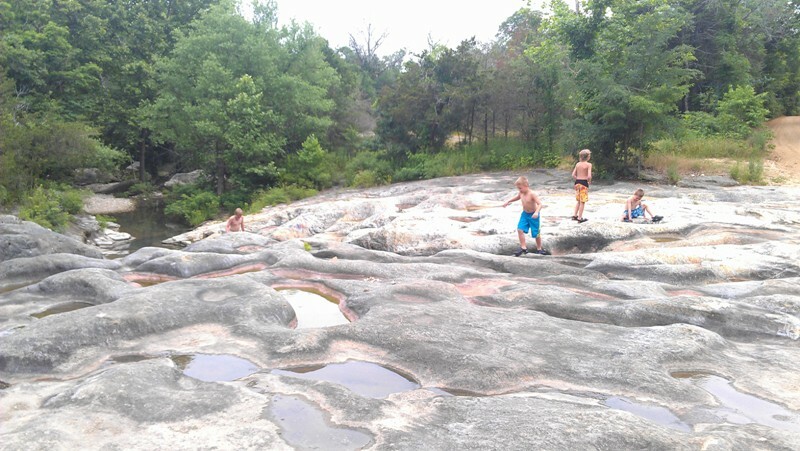 Since Aaron and Holly live in Tahlequah, they knew of this great place to spend the rest of the afternoon, 'the tubs'. A large rock where the creek had hollowed out lots of holes and chutes. The kids slid down the chutes like a waterslide. All too soon the week was up and the kids had all gone home. It's time for me to move on down the road, but I sure had a grand time. Thank you kids for giving your grandma such a great week. I had a day before my reservations started at Sylamore Creek Camp, so I stopped at Quarry COE Park, on the back side of Norfolk Dam. You can't help but wonder what would happen if that dam ever broke. When the dam generates electricity the Norfolk River has a lot of water in it and is flowing pretty fast. But when the turbines are turned off, the river drops dramatically and lots of dry spots pop up out in the river. Notice the low lying fog on the river? Just a few miles downriver, the Norfolk flows into the White River. These stairs lead down to Dry Run Creek, which flows into the Norfolk River just below the dam. It's a pretty little stream and up the creek is lies next to the fish hatchery. The fish hatchery provides trout to the entire White River Basin and the Illinois River Basin in Oklahoma. The usually turn the trout loose between 6 in and 11 in, these are here just for show. Inside the hatchery building are 20 tanks. Each tank hold between 35,000-45,000 baby fish. Approximate 60% survive to be transferred to the outside tanks until they are large enough to be released. This hatchery releases about 450,000 pounds of trout annually. No, that is not snow, it's pollen from the Cottonwood tree. No wonder I'm having allergy problems! Outside the hatchery is a boardwalk on Dry Run Creek. They have the ability to release trout directly into this stream, although most of the trout are trucked to other release locations. We had several days of rainy weather, so we decided to do some sightseeing. Heading south on Hwy 19, we planned on visiting Fallings Springs, Greer Springs and Cane Bluff on the Eleven Point River. Through some light rain, we hiked down to Greer Springs, and I found this vine to swing on along the way. I did this the first time I hiked this trail, too. The adventurers who didn't melt in the rain. Lower Greer Springs, 2nd largest spring in the Ozarks, with an output of 360 cu feet of water per second. Upper Greer Springs, located 100 feet above the lower spring, only provides a fraction of the water flow for the spring. The reason for the name 'Falling Springs'. Reading about Cane Bluff, it sounded like a scenic place to see. But the bluff was so overgrown, you couldn't tell it was a bluff. The Jacks Fork River is probably the most fun river to kayak out of the Buffalo, White, Currant and Jacks Fork. Here I found good size crawdad as we were getting out. Part of the reason the Jacks Fork is so much fun is the obstacles. The rapids aren't so bad, and the current is not exceptionally fast, but there are always lots of sharp curves to the river and downed trees to avoid, like that above. We were awaked early Saturday morning by the ranger, telling us to quickly, pack up and get out, the river was rising. And sure enough, within 24 hours, the campground was underwater. Below are some pictures from around the area, showing the flooding. Below the bridge in Eminence. One of the buildings in our campground. Notice how the street sign is barely above the water? No, that is not a creek, that is the trail to Blue Springs. The take out and boat launch at Two Rivers. That is a dumpster with only the very top showing in the background. Rocky Falls usually has only a little bit of water flowing down, and this is a popular place for picnics. Usually the rocks around the falls are covered with people, but I wouldn't venture out on the rocks today. The group evacuated the campground and moved down the road about 3 miles to Ozark Rivers Music Camp, where we finished the gathering. Unfortunately the next gathering at Van Buren, AR, had to be cancelled because of the same flooding along the rivers in the area. Next stop was Alley Springs Campground, located on the Jacks Fork River. One morning we all gathered to have a bagged omelet breakfast. I supplied the eggs and everyone else brought items to add to make omelets. After placing all the ingredients in a zip lock bag, you place it in boiling water until the eggs are cooked. Marian has hers all ready. You couldn't get a better breakfast anywhere. Across the road from the campground is Alley Springs Mill, which dates back to the late 1800s. One this day there was enough room between the gates and the water that several of us kidded about trying to kayak through the gates. But just a few days later, after the flooding, there wasn't much room left at all. Sadly, because of budget cuts (the sequester), the funds needed to fix the equipment isn't available. When I was here in 2009 the grinding equipment still operated. They have live music on the square in front of the courthouse every Saturday night. We were lucky enough to hear the Baker Family. The daughter is 11 years old, the base player is 9 years old and the fiddler is 14 years old. All the children play all the instruments as was demonstrating during one song when they traded instruments during the song itself. They occasionally even play in Branson. Many people watch the performance from across the street. We had dinner at the Ozark Orchard Restaurant, upstairs on the balcony. After dinner, some of us went downstairs to the Double O Saloon. Usually they have live music on Friday and Saturday evenings, but this was a weekend off. But we got the jukebox started and then the bartender and later the owner provided us with money to keep the jukebox going. They are having a contest for a name for their mascot, which is this beaver. We even got the locals dancing.